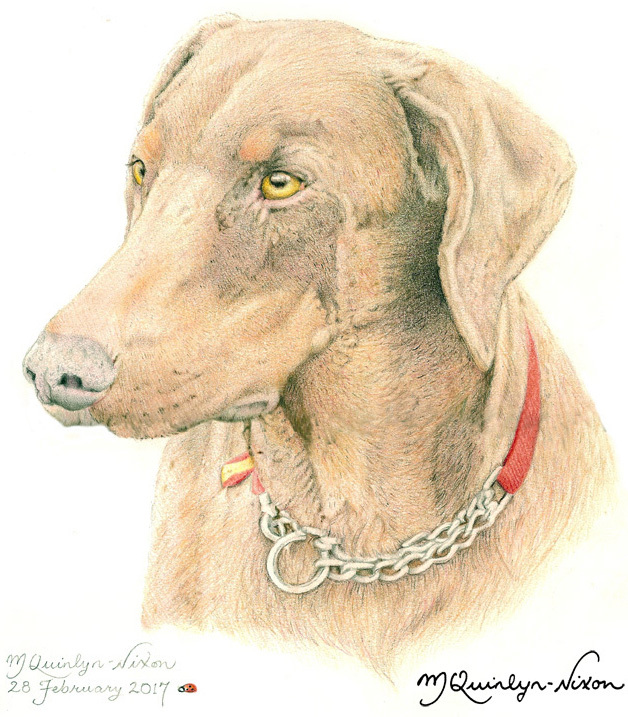 Dina, pronounced ‘Dinah’, is my fourth Doberman Pinscher illustration for Mary Redshaw. I have known Mary from my time working at a tertiary college and she has always had a love of dogs, particularly Doberman Pinschers, and during the last five-years I have drawn a succession of Mary’s beautiful dogs: Gina, Tia, Della and now Dina. For some reason, I always had a soft spot for Dina and despite the fact that she could be as mischievous as her sister, Della, I never wanted Dina to get the blame. I never got to meet Mary’s ‘girls’ apart from once, when I met Dina and took her and Mary’s whippet, Tina, for a walk. Dina was, by now, quite an ‘old girl’ and was having difficulty with her breathing and her walking was impaired, but despite all of this she had a beautiful nature and was a perfect companion for Mary and the spritely young whippet. I drew this commission after having looked at hundreds of photographs that Mary had taken of Dina; together we chose the one that we liked the best and that reflected her gentle nature. Using coloured pencils, chalk and a small amount of watercolour paint the illustration was completed in just over two-days. Mary asked if it would be possible to include my ‘motif’ of a ladybird, so that was included near my signature and is the first time I have done this for a pet illustration. I handed over the commission to Mary today and she was very ‘moved’ and said that I had captured Dina’s expression and character very well. It’s always nice to be able to see the expression in people’s faces when I hand over my work to them. One of Mary’s friends came to her house later in the afternoon and recognised Dina.